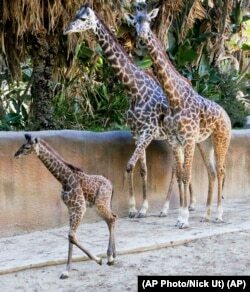 The giraffe is the tallest animal on land. These beautiful creatures are one of the best-known species in Africa. 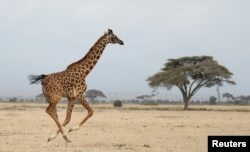 They are known for their very long necks, long legs and the brown and white patterns that cover their bodies. Craig Hilton-Taylor is head of the Red List program. He says in 1985, there were between 152,000 and 163,000 giraffes. But now, he tells VOA, their numbers have fallen to about 98,000. 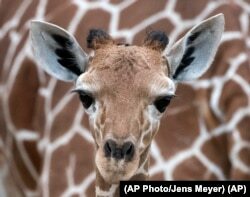 Fifty years ago, groups of giraffes usually had 20 to 30 animals in them. Now, observers are only seeing six animals in a group, called a herd. The Red List experts have been gathering information about giraffes over the last five years. They counted the animals from airplanes, land vehicles and on foot. They say that until now the disappearance of the animals had not been observed closely. One reason could be because giraffes live in a wide area across Africa. What is causing this decrease? Hilton-Taylor says: humans. He says pollution and the effects of climate change are just a few of the other problems affecting the species. Some people are moving into protected areas where giraffes and other animals live because of a lack of rain that affects food production. Sometimes the graceful, plant-eating animals are killed for their meat. Also, civil wars and unrest in Africa make it more difficult to protect the animals. It is harder to do conservation work—to protect the animals in danger—in areas of armed conflict. But, he says giraffes can be helped. Some of the ideas that work include community involvement and tourism. Tourism, for example, provides jobs for local residents. He also says there needs to be a giraffe action plan put in place to observe and survey the animals across the continent of Africa. Hilton-Taylor adds that finding answers to the problems people face, like drought linked to climate change, food shortages and civil unrest, will provide answers to help giraffes. The Red List is considered an important source of information about risks to animals and plants. The program says 24,307 of the 85,604 species of animals and plants it studied were in danger of extinction. Anne Ball wrote this story for VOA Learning English with material from Reuters. Mario Ritter was the editor.